With the exception of the shrimp and some pantry staples, every ingredient in tonight’s dinner was bought from local farmers’ markets. Even the white wine vinegar in the salad dressing. That’s my commitment to seasonal and local — changing the world one meal at a time. Click here for a high-resolution pic of the salad. Homemade croutons are the simplest thing. 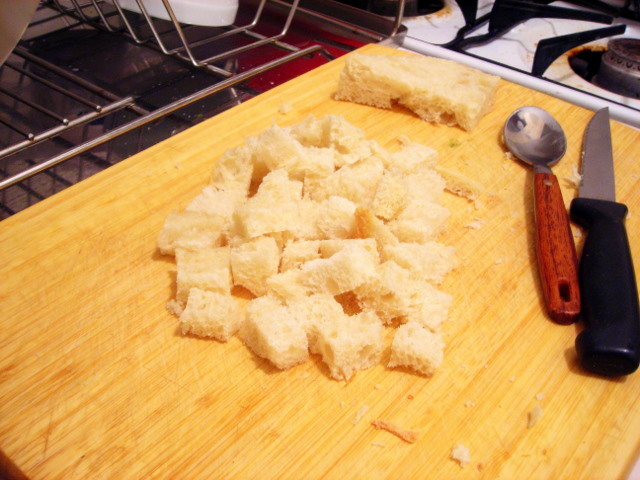 Take a thick slice of [stale] bread and trim off the crust, then cut into 1/2″ or smaller cubes. Sauté in melted unsalted butter over medium heat or until the cubes are golden brown. Do not burn. Remove from heat and let cool. Some chopped herbs or salt is nice. It’s so easy, it makes me wonder why people prefer processed food. Click here for a high-resolution picture of the cod. 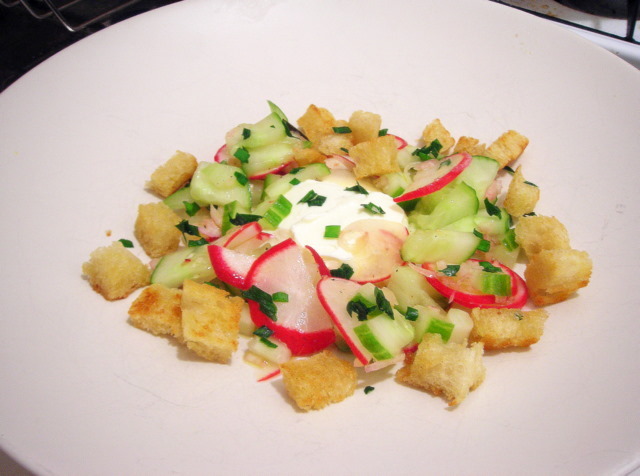 Combine radish and cucumber. Whisk together lemon juice, vinegar, chives and olive oil. Check seasoning. Add viniagrette to salad, teaspoon by teaspoon until dressing glistens; do not overdress. 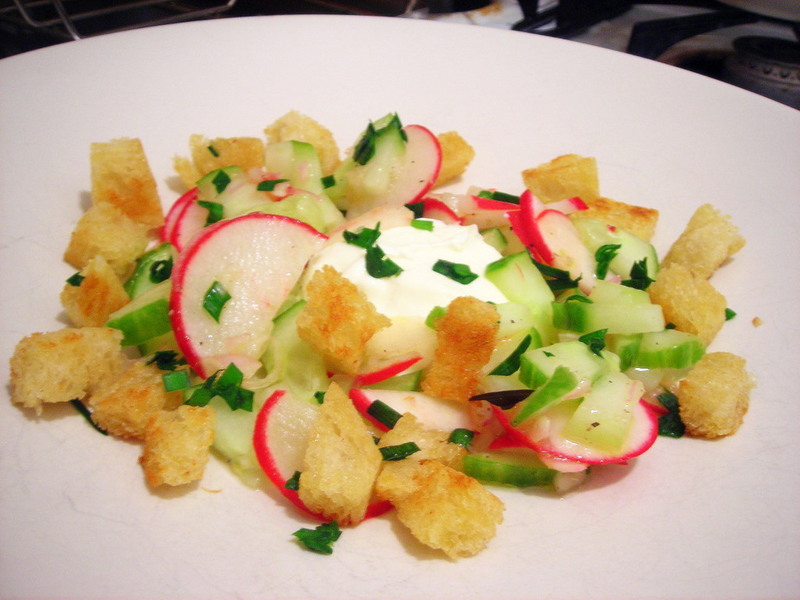 To plate, place a dollop of fromage blanc in the center of a salad plate. Spoon salad around the fromage blanc. 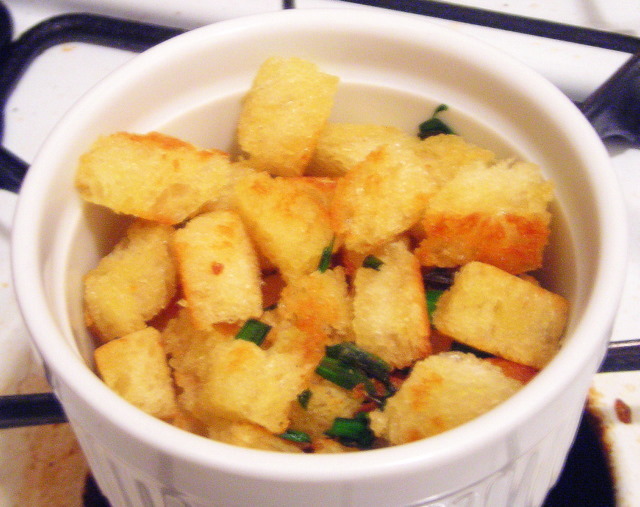 Scatter with croutons and chives, and serve immediately. 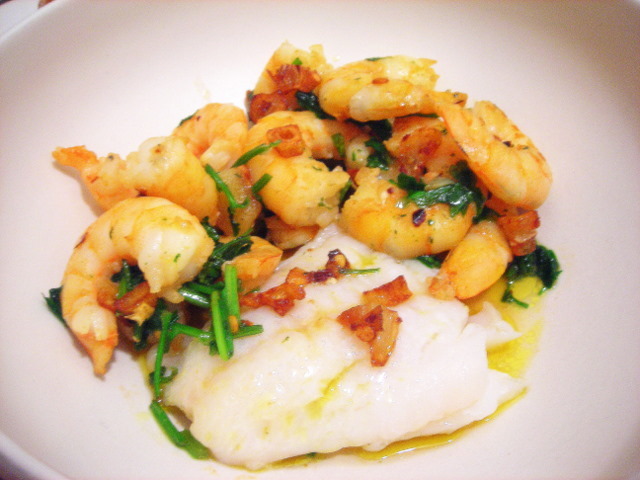 The cod was seared in an oven-proof pan with melted unsalted butter, then finished in the oven at 325 F for 10 minutes. Shrimp were peeled and tossed in a bit of kosher salt, then sautéed in olive oil with coarsely chopped garlic, red pepper flakes and parsley. 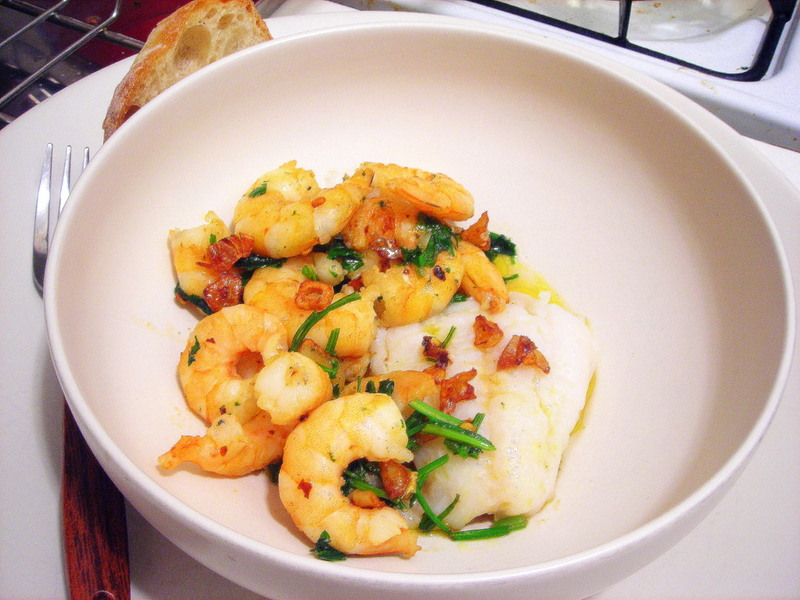 To plate, place a fillet of cod in a shallow soup bowl or plate. Spoon shrimp mixture around the fish. Drizzle a tablespoon of garlic oil atop the fish, check seasoning and serve immediately. 07 Jul	This entry was published on July 7, 2009 at 1:58 am. It’s filed under food, general, summer and tagged bread, cooking, cucumber, dinner, fish, food photography, fromage blanc, radish, recipe, salad, seasonal and local, shrimp, slow food. Bookmark the permalink. Follow any comments here with the RSS feed for this post. This looks terrific, but I’m still waiting on my “Ode to a true New York Pastrami” dish/article/preparation/sammich/whatever. Your posts always remind me that it’s time for food…..and, right now, it’s breakfast. Excuse me while I go and eat! Food is important, and it’s precious. It’s something that many, many people take for granted in this country. And it’s something that most of us don’t really understand beyond “what’s for dinner” or “what’s for breakfast”. It’s not something that people really think about in terms of the problems in the world around us. There are important problems that need to be addressed — things like the environment, pollution, obesity and so forth. These issues aren’t going to go away. If anything, they’re only going to get worse from here on in, at least if the present generation doesn’t begin to finally do something about them. There’s a lot of hope out there. Collectively, we’re only just beginning to realize and to WAKE UP to the fact that we have power. Power to effect change in the way we want to live. It begins with one person at a time. Hey, Mr. S: THANKS for this lovely menu using COD….it never occurred to me to finish fish in an oven for a few minutes……….so JUST a SEAR, and let the oven finish the cooking….THAT DOES seem a perfect way to avoid drying the fish out……something SO easy to do …. Oddly, we JUST brought some home this morning from our store. The croutons are look good. Thanks for the idea.